Decorated veteran keeps the lid on WII propaganda film until unlikely documentarian starts asking questions. Trading carbon credits, or "cap and trade," is a promising free-market solution. Shawn and the fishing crew endured hurrican force winds and 25 foot waves - it took them 26 terrifying hours just to go 22 miles to the safety of shore. Shawn Dog is a self-described adrenaline junkie. From fishing the most dangerous waters in Alaska to jumping out of helicopters to ski down unnamed mountains he has truly been at deaths door many times and came out triumphant. Shawn Dog shares a couple of fishing stories that are just common day events in his adventurous life. One of my father's earliest memories is of hiding. Many thanks to my father Henryk Kranz for telling this story. He is a light to us all. And, of course, to Jozef and Eleonora Baran – the brave souls who saved my family – the utmost gratitude. "To not pay for it, it would kinda smell." Sound composition -- How cold is 'below zero'? Several years ago Zana Briski, a photographer, found herself giving photography lessons to children living in the brothels of Calcutta's red light district. She told Lu Olkowski about the challenges of trying to change people's lives with art. An audio documentary of several Baltimore residents' memories of Coretta Scott King visiting Baltimore in 1969. Fifty years ago, in the mid-1960s, Martin Luther King, Jr. was drawing his movement’s attention from civil rights to economic justice. The rights of the working poor cut across racial divides for King and for his wife, Coretta Scott King. They saw the civil rights movement as intertwined with the work of unions to raise wages and improve working conditions. In the 1960s African Americans were moving into cities as jobs and factories were moving elsewhere. For most of the poverty-stricken people in this country are working everyday. They are making wages so inadequate that they cannot begin to function in the mainstream of the economic life of the nation. They are working full-time jobs for part-time income. When Dr. King was assassinated a month later, he was in Memphis, Tennessee organizing his “Poor People’s Campaign” and preparing for a march with striking sanitation workers. 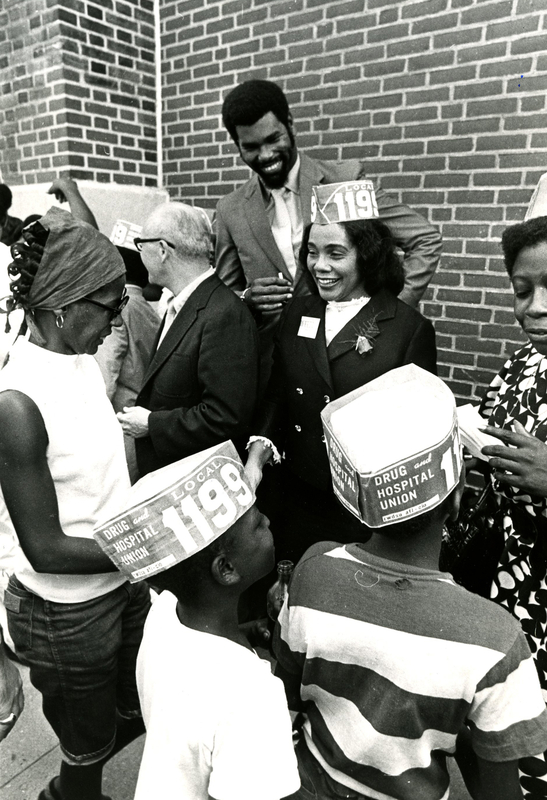 Just days after his death, his widow led a march in Memphis with those workers … and a year later, continuing her work on the Poor People’s Campaign, she came to Baltimore to speak to ’the Hospital and Nursing Home Employees Union, Local 1199E,’ which was seeking the right to represent hospital workers. To understand the connection between the civil rights and worker rights movements here in Baltimore, producer Jonna McKone spoke with long-time activist Bob Moore – who was awarded an Unsung Hero of the Civil Rights Movement Award by the City of Baltimore Community Relations Commission in 2000. She also sat down with two members of the 1199 union, Annie Henry and Laura Pugh, who met Coretta Scott King in the late sixties.